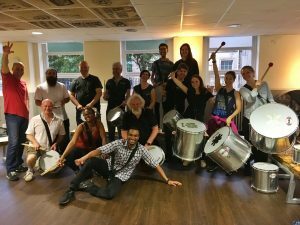 Join the fun for two taster sessions and get into the groove with Brazilian and African drums. Try your hand at something new, no experience required! Suitable for all ages, and a perfect way to spend your Sunday afternoon getting some funky rhythms together with other like-minded folks. Children under 10 should be accompanied by an adult. You can come to just one workshop or both. Ticket sales for these workshops will go towards this year’s Mossley Light Festival on Saturday 25th Nov.
We are excited to welcome Emma Marsh from Global Grooves to lead these taster workshops. Emma has been performing and leading workshops since a young age, and the workshops promise a lot of fun, energy, and toe-tapping grooves! She completed the Global Grooves ‘Future Leaders’ programme in 2014 and has since been leading her own youth percussion band ‘Jubacana’ in Oldham and has been assistant musical director of percussion and dance group ‘Juba do Leão’. Note: Please do book in advance if possible so we can ensure there are plenty of drums for everyone wanting to attend. Thanks in advance!